And that’s precisely what Paul Halter gave his readers in 1993, when he wrote his book Le Diable de Dartmoor (The Demon of Dartmoor). This is a fabulous book— without a doubt, it’s one of the best I’ve read in 2011, and it’s surpassed Le Tigre borgne (The One-Eyed Tiger) as my favourite book by Paul Halter. We start with something of a prologue, taking up about five chapters or so of the book. The events here, however, are just a warm-up for the main course. The setting, of course, is Dartmoor— more precisely, the village of Stapleford. Over a period of three years, three young girls are killed at the same time of the year, having been lured out to the Wish Tor and then pushed down to their dooms. Witnesses at each crime scene establish one thing— the girls must have been murdered by an invisible man! For before their respective dooms, each was seen chatting merrily to someone nobody else saw… and two witnesses declare that the second victim fell as though shoved from behind. There’s a small catch, though: nobody was there with her! The Wish Tor... Do you see the invisible man? A few years pass without incident, and the village more or less breathes a sigh of relief. Enter promising young actor Nigel Manson, who purchases Trerice Manor, where 50 years earlier, a woman was pushed down a staircase in front of witnesses, apparently by invisible hands. Nigel isn’t daunted by that story at all— in fact, it was the inspiration for his smash-hit new play, The Invisible Man. (H. G. Wells should sue.) He has the house renovated, and then does something singularly foolish (especially in a mystery): he invites his mistress, Natalie Marvel, and a man named Frank Holloway to spend the weekend with him and his wife, Helen. No, there’s no spontaneous snowstorm that cuts them off from the outside world. Instead, Nigel and Frank go out to The Red Lion and get gloriously drunk with a trio of comrades: Dr. Thomas Grant, a philosophy professor named Victor Sitwell, and the village drunk Basil. Upon his return, Nigel mumbles some things that his wife takes for drunken ravings and pays no attention. The next day, Nigel remembers that he invited his new friends over to the manor, which causes some more tension in the household. Luckily, Inspector Archibald Hurst’s boss really has it in for him, sending him to Dartmoor on a “small case” that’ll do a load of good for his lungs. Hurst brings his companion, Dr. Alan Twist, with him, and together they investigate the mysterious occurrences, which seem to be a collaborative effort between Satan and a monster from science fiction. The impossible crime is sublime. This really is one of the best tricks I’ve ever read about. 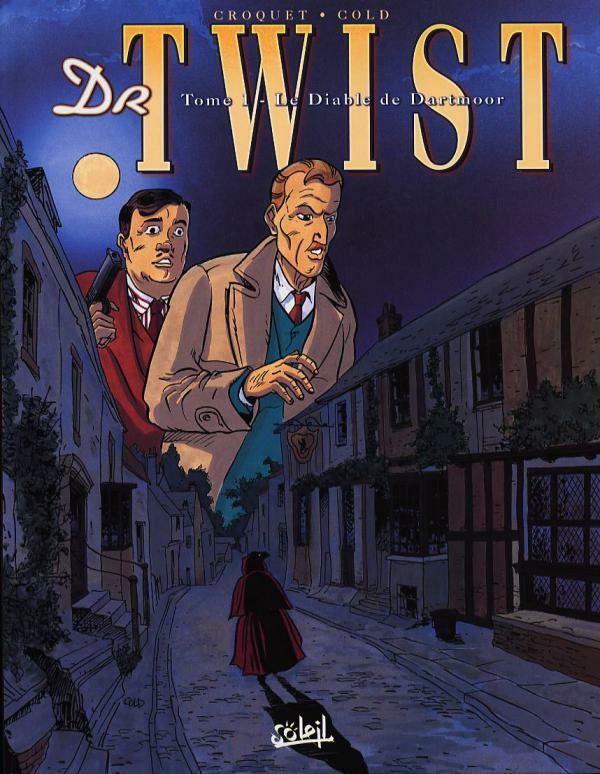 It’s simple, it’s dazzlingly effective, and Twist even explains how the culprit could have gotten away with it if it somehow went wrong and Nigel wasn’t killed by the fall. The clues are brilliantly placed, and Halter plays with his readers like a violin. I had the culprit pegged out for a moment there, and Halter sent me off on a wild goose chase, only to cackle wildly at the revelation. Some of the clues are insanely good ones, and you have no idea how hard I’m resisting the urge to point some of them out. Not only is the impossible crime good, but the atmosphere is brilliantly effective as well. Halter apparently wrote this book after visiting England for himself, and it really shows. Halter sounds like he knows what he’s talking about. The descriptions of the countryside are marvellous and awe-inspiring, but at the same time, a sinister presence seems to be lurking in the shadows. As with the best of John Dickson Carr, Halter manages to make his reader doubt that there will be a rational explanation for the crime. Also, his characters are surprisingly good. They’re not particularly revolutionary, but they’re interesting and they seem genuinely English, which is a nice change. 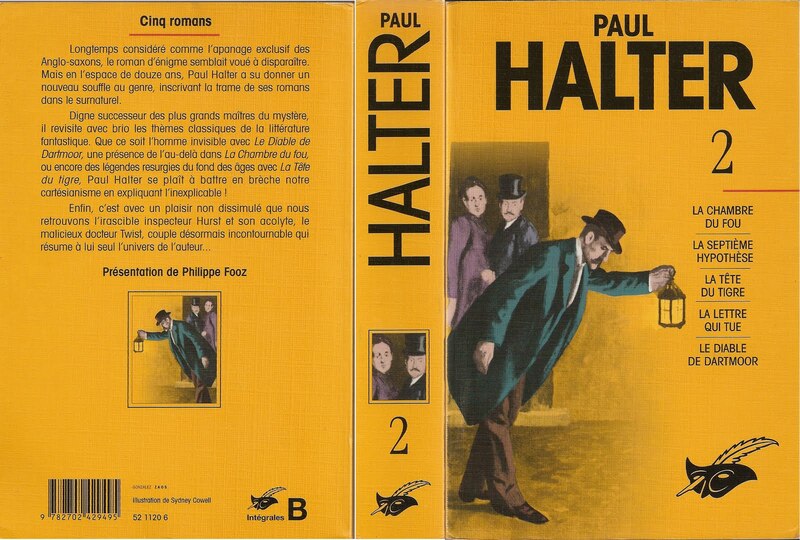 (Halter’s characters are often English in name only, with characteristics that seem far more French.) The setting is nicely managed and contributes quite well to the atmosphere. As for the detective duo, Dr. Twist and Inspector Hurst remain much the same, and I like it a lot. “Colourless” would be an unfair label, but it might give you a good idea of what I mean. Their purpose is to investigate the crime, not moan to their readers with stories of their sexual lives and deprived childhoods. They have interesting idiosyncrasies, habits, and eccentricities, and Halter does it so well that I don’t demand any more. 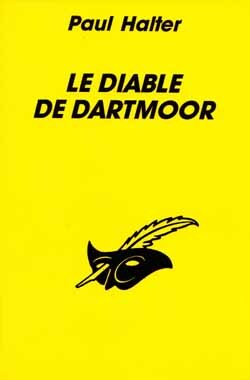 Overall, Le Diable de Dartmoor is a triumph. If I were to create a list of the 100 greatest locked room mysteries and impossible crimes, it would make its way on that list. Halter does everything right, and it’s just a wonderful read from start to finish. It even got me up at 6 in the morning to finish reading! Yes, I woke up that early during my vacation to read a French book, armed only with my trusty dictionary (which I referred to only a handful of times). My edition of the book is in the second of Le Masque’s Paul Halter omnibuses, complete with a good introduction by Philippe Fooz (although I disagree with his concluding statements), who talks all about the recurring themes in Halter’s work. 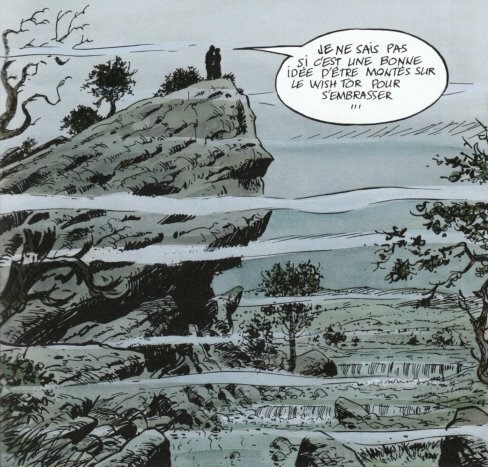 As an interesting aside before we part, a comic book adaptation of Le Diable de Dartmoor exists. (I refuse to use the term “graphic novel”.) Adapted by Jean-Pierre Croquet, it looks really nice, with some very good illustrations that I’ve stolen to illustrate this blog post. I don’t own a copy, but I hope I will someday. Although it claims it’s “Tome I” in a Dr. Twist series, no other published adaptations exist to my knowledge. 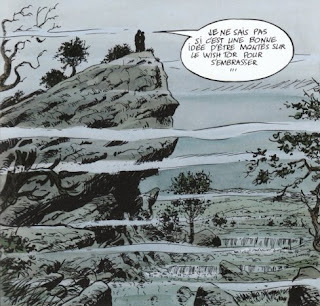 The artwork of the comic book adaptation looks very attractive and if it's incorporated correctly into the plot it can elevate the story even higher. After all, one of the few redeeming qualities of Kindaichi was its atmospheric artwork sucking you into the story – even if the plot was atrocious at best. By the way, the impossible situation you described immediately suggests a horribly cheap solution to me involving a blunted crossbow bolt (or a similar padded projectile), but it's not anything like that right? No, no- it's far cleverer than that. Hence the reason I give the book such praise. I just want you to know that I read your blog regularly, and I really enjoy the enthusiasm that you put in your reviews. Great to hear from you, GKCfan! I'm glad that this blog manages to convey my great enthusiasm for mysteries of the GAD era and general mould- it's what I try putting into every review. I really like your blog but I've read four Halters and they were terrible, banal writing and poor dialogue. The sole saving grace is are his puzzles. In short, he delivers an excellent turn and prestige but a poor pledge! I agree that Halter's style is not always the best, but I found this an exception. Then again, not being French, I may not be the best person to comment on style. Either way, the great attraction to Halter for me is the plot, which is just compulsive. Halter's imagination is intriguing and the way he answers his locked room problems is equally interesting.